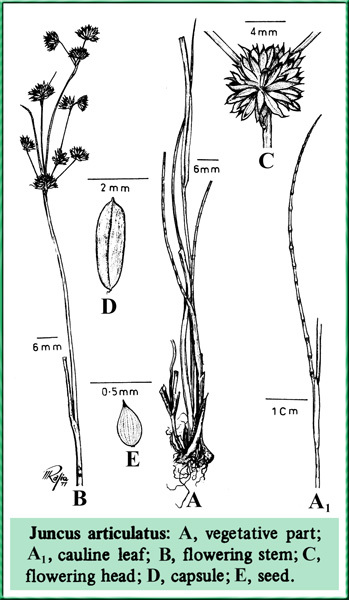 Juncus articulatus.M. Rafique.Flora of Pakistan.www.efloras.org (Accessed 5/2014). Juncus articulatus is a perennial rush 10-60 cm tall, stems arising along a rhizome in loose clumps. Leaves alternate, 2-4 on stem, 2-15 cm long, about 0.1 cm wide, round in cross section, containing spongy, loose tissue that holds air (aerenchyma), and crossed at intervals by partitions (use lens, hold leaf to light or run leaf firmly between fingers; septate-nodulos). Flowers brown, in small half-round heads of 3-10, petals narrowly lance-shaped, 0.3 cm long, slightly longer than sepals, stamens 6; fruit brown to purple-brown, 0.3-0.4 cm, longer than petals, sharply 3-angled, tip sharply pointed, internal partitions incomplete; inflorescence widely branched; blooms July-Aug.
Habitat: Bogs, wet meadows, soil pH 4.8-7.5 (USDA, NRCS 2010).